Offered in 6000-6012, 6200-6212, and 6300-6310 sizes with bore diameters from 10-60 mm or 50 mm, single-row POP Series features double-lipped labyrinth seals, which protect against contamination. With temperature range of -50 to +150Â°C, lubricant ensures quiet operation and minimizes starting torque, even at low operating temperatures. Bearings come in open version, 2RS2 sealed version with 2 synthetic rubber seals, and 2Z sealed version with 2 steel shields. Steyr, Austria, May 2007. Austrian bearing manufacturer NKE Austria introduces its new range of single row deep groove ball bearings. As one of the most frequently used bearing types worldwide, single-row deep groove ball bearings are used in an extensive range of applications, which places high demands on their performance and cost effectiveness. The new NKE POP range of single row deep groove ball bearings offers numerous technical advantages, such as reduced running noise, longer lubricant service life, a low starting torque and outstanding cost effectiveness. The new NKE deep groove ball bearings are subject to stringent, documented quality inspections as well as 100 percent noise testing, which helps ensure their high precision and quiet operation. The low running noise is achieved through the use of a new type of lubricant, which also minimizes the bearing's starting torque even at low operating temperatures. The lubricant has a long service life over a wide temperature range - from minus 50 to plus 150 degrees Celsius. The bearings feature a pair of newly developed double-lipped labyrinth seals, which provide better protection from contamination and improve grease retention in spite of the low friction. The bearings' raceways have an enhanced surface finish, which reduces wear and keeps the operating temperature low. Their high-grade balls ensure smooth running and reduced noise compared to conventional deep groove ball bearings. The new POP range of single row deep groove ball bearings is available from stock in the size ranges 6000 to 6012, 6200 to 6212, and 6300 to 6310, with bore diameters from 10 mm to 60 mm or 50 mm, in open version, 2RS2 version (sealed with two synthetic rubber seals) and 2Z version (sealed with two steel shields) and with clearances CN (standard) and C3. Other versions and sizes are available on request. 1. NKE's new POP range of deep groove ball bearings offers many technical benefits for a wide range of applications. 2. The newly developed NKE double-lipped labyrinth seals provide enhanced protection from contaminants with reduced friction. NKE Austria GmbH is a bearing manufacturer with headquarters in Steyr, Austria. Founded in 1996 by a group of senior staff members of former company Steyr Wälzlager, NKE offers both standard and special bearings for all industrial applications. NKE's core functions - engineering, product development, final processing of components, assembly, quality assurance, logistics, and sales and marketing - are centralized at its Steyr headquarters. The site is accredited to ISO 9001:2000 (design, development, production and distribution of bearings) and ISO 14001:2004. 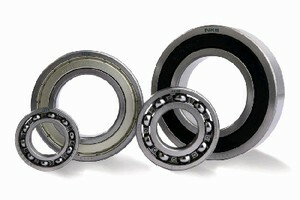 Its wide range of standard bearings is available from stock or at short production lead-times. It also provides tailored products and solutions. In addition to product and application development, NKE also provides a full range of technical services, consulting, documentation and training. NKE's products are distributed through 14 international representative offices and more than 240 distribution outlets in 55 countries.